Since we are going headlong into soup season, I thought I would share this recipe for a quick-cooking supper, based on both my basic recipe for Indian curry dishes and on a soup that the Bun likes to get for lunch from one of the eateries near his office. 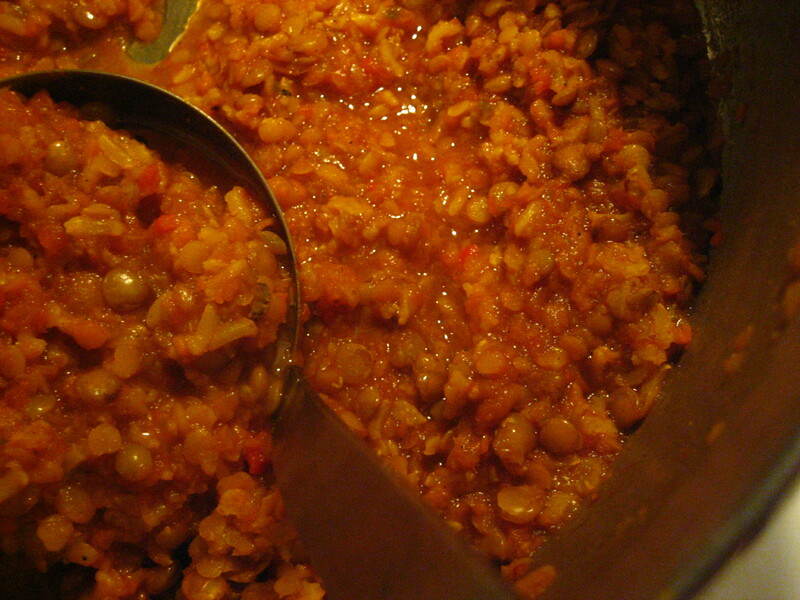 It may not look like much, but this dish, with its combination of brown rice, brown lentils, and red lentils, qualifies as a complete protein. Where I am not exactly sure how the chemistry of this works, I do know that the combination of legumes and whole grains is not only good for you, it is delicious. With the heat of the chilies and the depth of the curry powder, this stew will warm your belly and your soul, which is much needed in the forthcoming cold months. If there is interest, I might start a “Meatless Mondays” regular post. I read recently that this concept started during wartime, to save on resources and ease the pain of the pocketbook. Seems like a good idea to me, and I love the challenge of creating a satisfying meal that does not focus on meat. yeah! meatless monday! please, please, please do it. have you ever made roasted cabbage strips? really long strips drizzled with olive oil and cooked in the over at 500. akin to kale chips, i think. Fabulous. Meatless Mondays they shall be. What kinda cabbage do you use for the chips?! I used a regular green cabbage head. Someone I work with mentioned the recipe, so I google a bunch and pieced my own together. Would love to see what genius version you design. There’s a restaurant in Brooklyn that make an amazing white cabbage salad. Not wintery, but really good. John! Thanks for the shout out — I heart you!! That lentil rice bizness looks delectable — hearty fall goodness! Ha! No problemo, Alyson! Check out http://www.thesartorialist.blogspot.com when you have a chance! A fantastic staple that I have certainly eaten a lot in my travels and even at home. I love the use of a mirepoix as a base. I’m definitely going to have to make some soon.